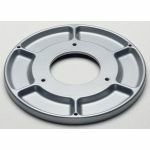 The cast aluminum 312 Parts Tray Base Mount has six integral parts wells with rounded and sloped walls for easy parts removal. Neatly organize your small parts and tools! Overall diameter is 8 1/2" (215.9mm) and provides extra stability. Includes six non-marring, anti-skid neoprene base pads. Three 1/4 - 20 holes are drilled and tapped on the outer lip for mounting accessories such as the 371 Solder Station. Three 1/4 -20 screws for mounting Bases are included.